There is something to be acknowledged in the privilege that university educated students have when they enter a community theatre festival such as the Zwakala Festival at the Market Theatre. Yes, the festival is undergoing its own change in identity. Yes, it has transformed due to financial constraints and a change in mandate due to these economic undercurrents. A festival that previously saw the showing of numerous productions from community theatre groups and individuals now hosts only four productions. The productions are each furnished with a mentor. James Ngcobo, the Market Theatre’s Artistic Director, sees this as a more focused way of ensuring stronger productions compete for the top spot, with the winning production receiving support for its own run at the institution. But, when Mahlubandile Nontlanga, a UCT graduate and Wits Drama for Life postgraduate, states, “I believe there’s no such thing as a community theatre festival”, questions need to be asked about what community theatre is. 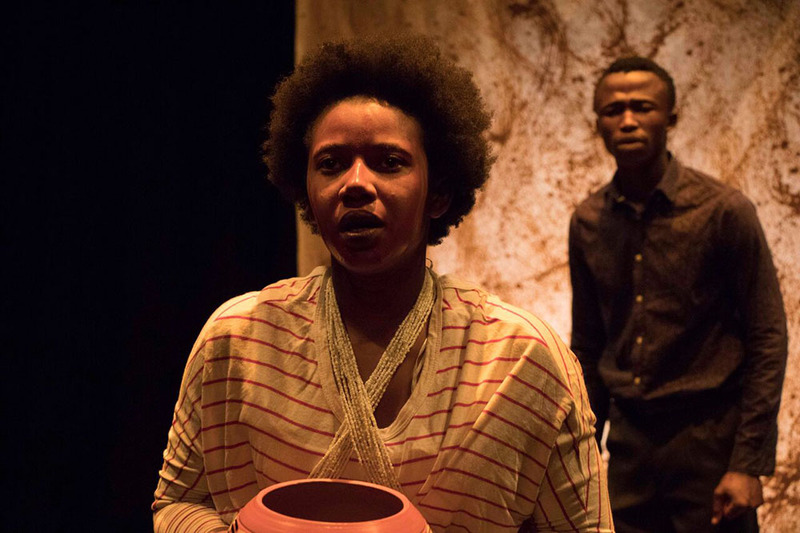 Nontlanga’s production What Was Is No More strikes at the heart of decolonial debates around spirituality versus religion. It is relevant. On the one hand, there is the father who sent his daughter to study in the United States in order for her to get a ‘more civilized education’. He is a spirited old man played with charm. On the other hand, the daughter is a ‘woke’ young womxn who has come home having failed her degree, and troubled by the physical and psychological symptoms of having received a calling. The father represents the colonized black man and the daughter stands for the decolonized black womxn. The tension between them is volatile. It is the tension of history versus the present. The two engage in a competition of ideas that mirrors the competition taking place within the festival itself. The historical community theatre that gave the Zwakala Festival its identity and the present reimagining of what community theatre is. Or, in Nontlanga’s conception, the dissolution of the idea of community theatre. “Theatre is theatre,” he says. The politics of the form or theatrical language of creation do not seem to factor in his response to the question of whether he experiences any conflict with entering a community theatre festival. For Nontlanga, What Was Is No More is a personal narrative. He says he “lived in conflict of who to go to when things happened”. Raised by his grandmother who believes in traditional rites and his mother who is a born-again Christian, Nontlanga understands the personal site of the competing factions of spirituality versus religion. This is made visually clear in the stage design. A white muddied strip of cloth is the backdrop for the performance. It stands center stage and cuts the space in half, becoming the in-between space for the use of shadows as well. The device is clear. The shades stand between the pair. What the work misses is a sense of the personal as political. The story onstage remains rooted in the father-daughter site of emotions and does not lend those emotions to a politically historical, hurt, or hope. The father is the framework of the play. It is his grief over the loss of his own parents- who were traditional believers and died leaving him in poverty- that is the pivot of the stunted plot. The father is stuck in the space of denial. He never grieves any loss incurred, from his parents nor his wife, and inevitably, his daughter. He does not shift from his position at the start of the play through to the end. The daughter arrives and leaves him exactly where she found him. “A story is a story,” Nontlanga states. What Was Is No More is a particularly black story in its subject matter. And, it is a story told with a clear sense of craft. The father’s immobility is the site of the setting. The site is denial. It receives the third prize in the festival because, as curator Themba Mkhoma paraphrases the judges’ ruling, it was due to “umdlalo kunokuthi uhambiswe istory. Fanele uhambiswe ama events”. Events needing to drive story is a general statement applying to any number of forms of theatre. In considering how community theatre functions where a story certainly is a story, not all theatre is made the same. In community theatre, the events form an epic narrative. It is a narrative that moves and one where multiple actors in the space of the story are connected through multiple series of events. Community theatre plots implicate more than the people who are in conflict in the story. It is always political, even as it is intensely personal. Community theatre deploys a distinct kind of theatrical realism. It does not obey the unities of time and space. As in any epic, it will cross a large section of time and traverse many different spaces. The actual movement from one place to the other acts as the connector for the multiple lives that are interconnected by the story. In this way, community theatre enacts the work of the term community. It is about belonging. This particularly black sense of communal interconnectedness drives the plot to heightened levels of tragedy; and, the tragedy becomes political through the interconnected philosophy of black living. It is political, not just in subject matter but also in its form. In What Was is No More, we are not in “a” community theatre. The actors speak over each other in a cacophony of one mind in denial. They are individuals only hearing their own thoughts. The problem then, is the patronizing use of the term “community” in paternalistic development work. It seems important for black artists to acknowledge this history without then denying the work done in historical community theatre.